Hunger may be closer to your doorstep than you think. There are over 50 million Americans who suffer from hunger according to Feeding America. This crisis can show up in any community. Volunteers play a large role in helping food pantries cope with the increasing need for help. In the following interview, Shanon Chaput, a volunteer at the Mason Food Pantry in Southwest Ohio, shares her story about getting involved in the fight against hunger. Tell us about the community where your food pantry is located. 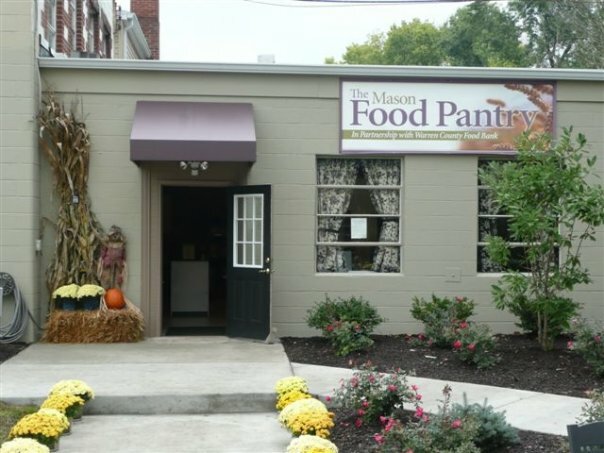 The Mason Food Pantry is located at 406 Fourth Avenue in Mason, Ohio. People think of Mason as a very wealthy town and are surprised that the city actually has people in need of food assistance. What is the level of hunger in the Mason area? Quoting the Mason Food Pantry website: “In December 2008 the pantry served 247 people. In December of 2012 the pantry served 667 people.” These numbers represent the month of December, not the calendar year. How did you decide to become a volunteer at the Pantry? I chose to be a volunteer at the Mason Food Pantry because my kids were in high school and had their driver’s licenses and really didn’t need me to drive them around as much as I did when they were younger. Tell us about some of the people who rely on the Pantry. What is their story? Unfortunately some of the people who come to the food pantry are victims of their own poor decisions. Many more however are desperate for help because they have been fighting cancer and other ailments and have prescription medications that sap every spare penny. There are a lot of elderly people who frequent the pantry and I often wonder if their families know about their predicament. How can someone help the Mason Food Pantry?